There are five stages of the buyer’s journey – awareness, interest, consideration, purchase, and loyalty. As your buyers progress in their journey, you will need to deliver personalized content according to their behavior and where they are in the sales funnel. In this post, you will learn about how to deliver personalized content throughout the buyer journey. Your buyer’s journey begins from this stage. Once the buyer realizes that they have a problem they try to research about it. They try to educate themselves about their problem and its possible solutions. So at this stage, your goal is to educate your potential customers through personalized content. Use social media posts, print ads, YouTube videos, and/or blogs to reach out to your potential customers. If you prepare buyer persona it will help you target even better. You can also ask influencers from your industry to write blog posts. This will help you get the attention of your potential customer. However, make sure that the influencers are expert and relevant to your niche. To save time, you can use tools to search for relevant influencers from your industry. Tools like Grin enables you to use filters like location and niche etc to select the most suitable influencers. 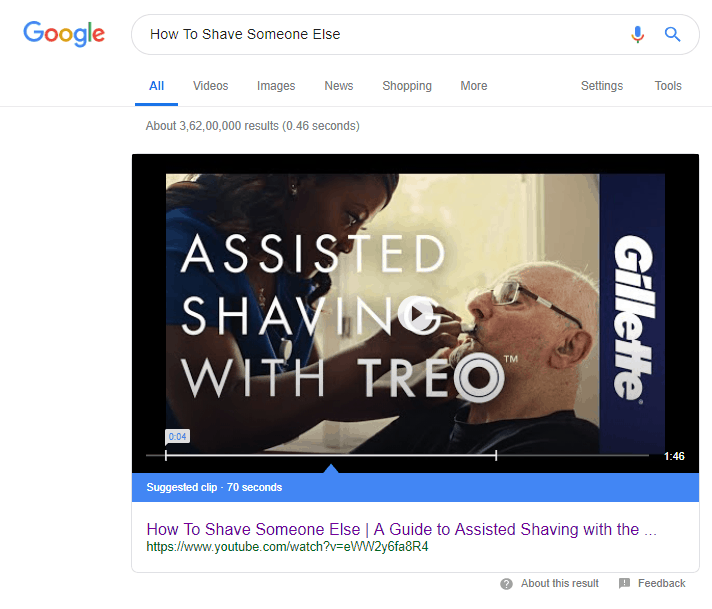 For example, if you search “how to shave someone else” the 1st results on your search engine you will see is of Gillette with their YouTube video. Content like this will motivate them to visit your website and make a purchase. Ensure that your content addresses the problem of your buyer and provides a solution to it. The video takes through a step by step guide on how to shave someone else. Here the brand is promoting its product, a razor, which is designed only for assisted shaving. The video managed to receive more than 35k views. Although social media content cannot be completely personalized content, at least you can personalize it based on your target customer personas. Video content or blog posts will drive traffic to your social media profiles or websites. At this stage, you need to give the buyer an opportunity to explore and learn more about your brand. After doing a lot of research and comparison, the buyer might show interest in your brand and product. It is time for you to provide more targeted messages to your buyers and give solutions to their pain points. So, what type of content do you need to use to get the attention of your buyers? You can use ebooks, guides, blog posts, and/or tip sheets. Your content needs to highlight a unique selling point to the buyers. 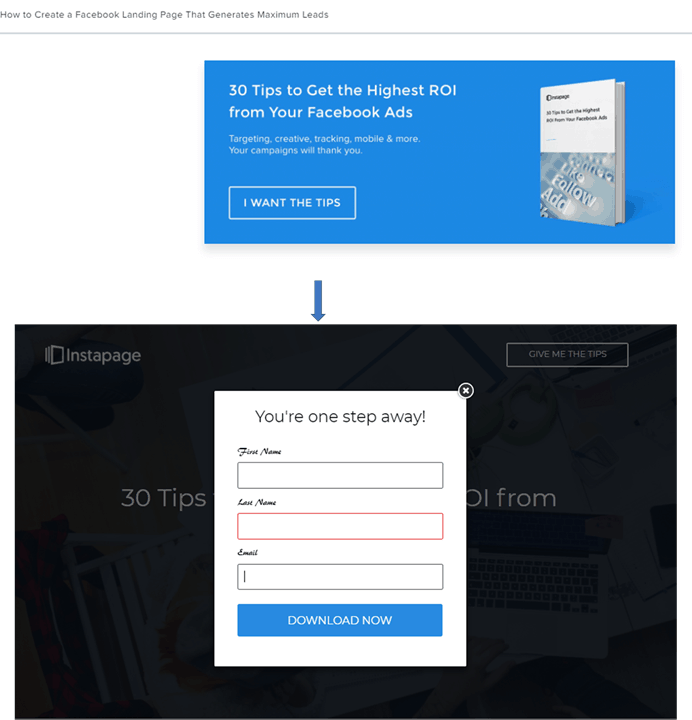 At this stage, your goal should be to drive people to your landing page and encourage them to sign up. Again, you need to use personalized content to target your intended audience depending on their behavior. If a user is engaging with your content, show suggestions for similar content. If they are about to leave, entice them with an offer. For instance, when you search for “how to create a Facebook landing page” the first result on the search engine is a blog from Instapage. When you open the blog and scroll it down, at the end of the blog you can see a lead magnet. 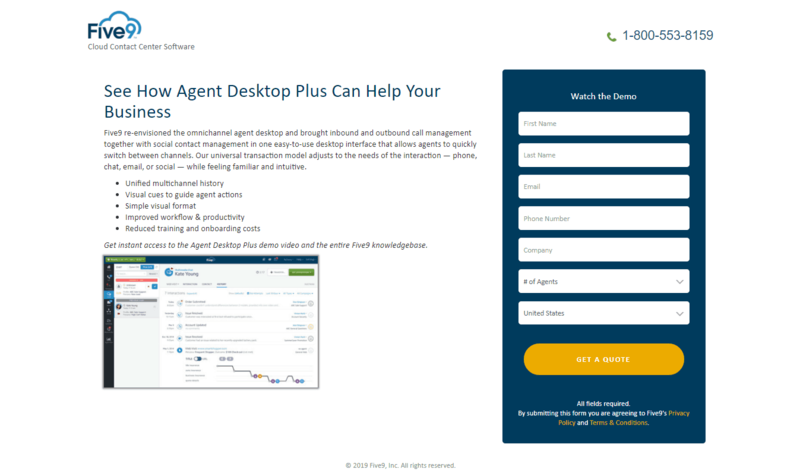 Once the buyer clicks it, they are taken to the landing page of the agency. And to download the tip sheet buyer needs to fill a form with their email id. You can also post personalized content on social media to target the interested buyers and get them to visit your landing page. Once they sign up, you can start the process of nurturing the lead. You can even segment the email list and start nurturing the leads based on their interests and preferences. Now that you have generated quality leads, in this stage you need to nurture the leads and convert them to customers. At this stage, both the potential customer and the business is trying to get more information about each other. Businesses need to gather more information, like – how big is the company? What is the role of your potential customer in the company? Can the company afford your solution? To find out answers to this question, you’ll need to identify the favorite content of your lead through email analytics. Based on the analysis, you can segment your leads and offer scaled personalized content to them. Offer more relevant resources through landing pages that have big lead capturing forms. The forms will ask more specific details which will help your marketing team to convert leads into customers. Your leads are also gathering more information about your business like are you trustworthy, expert, and authoritative source. Here they are looking for resources which will testify your performance. You can use content like case studies, webinars, white papers, reports, and lead capture landing page. Reports indicate that you are the leader of the industry. Whitepapers reflect the depth of your knowledge. 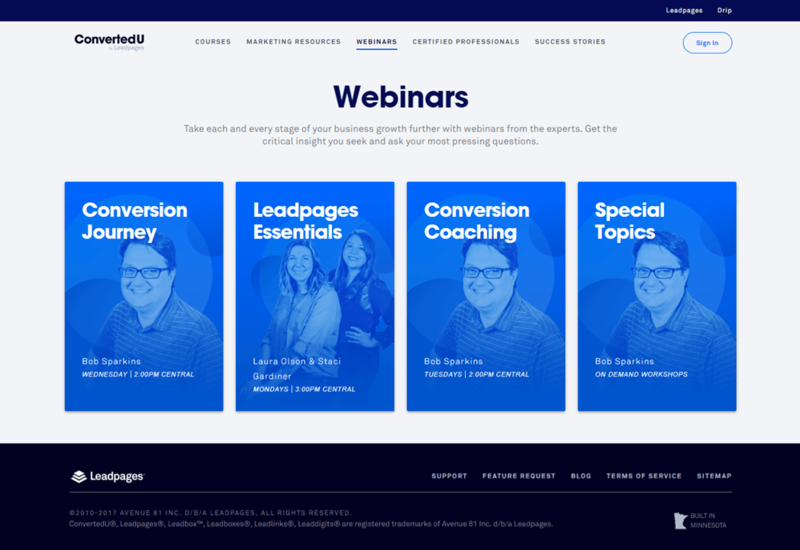 Webinars help you get the attention of your leads. And case studies prove that your solutions are successful by giving real-life examples. So, you can choose the type of content based on your target audience and their preference. For instance, Leadpage exhibits their knowledge via webinars and prove themselves to be the expert in the industry. You have reached a stage where your buyer is on the edge of purchasing your product or services. So, to convince the buyer, you need to create highly personalized content which proves that you can meet their requirements. You can select content forms like a free trial, customer stories, sales page, demo, and/or FAQs to personalize the communication with your buyer. At this stage, you need to use very compelling, personalized content to drive conversions. To create such content, you need to identify the problem which is stopping the buyer from purchasing your product. Once you identify this, it will help you choose a content type and create a high-converting sales page. For instance, Five9 uses the demo content format to encourage their buyers to buy their product. The screenshot below is from Jon Loomer Digital, they have used personalized sales page to convince their buyer to purchase their product. There are a few customer success stories mentioned at the end of the page as well. If you think that your buyer’s journey ends because you have successfully converted them into your customer. Then you cannot be more wrong. Your business will grow when you convince your customers to buy again. Happy customers lead to the growth of your business. You can use personalized content like in-app messages, social media content, onboarding emails and/or help desk to keep your customers happy. 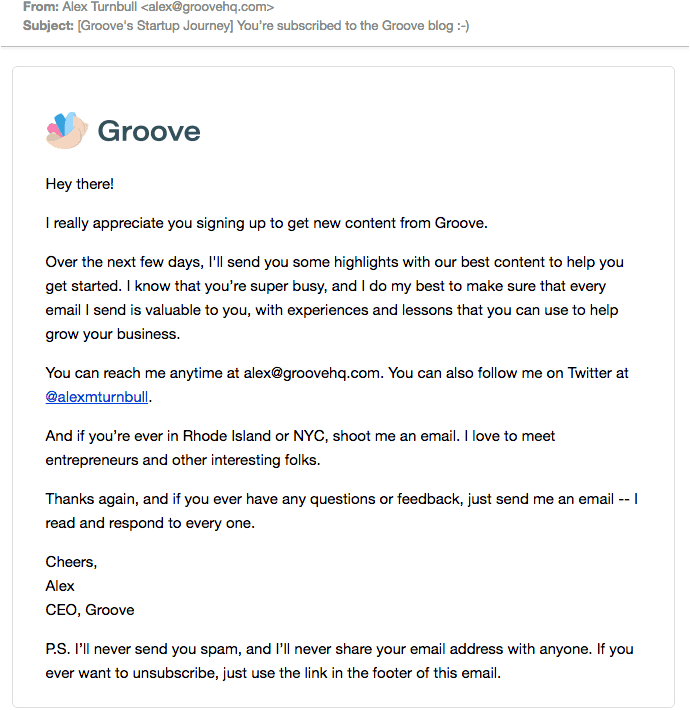 For example, the following screenshot is an onboarding email from Groove. 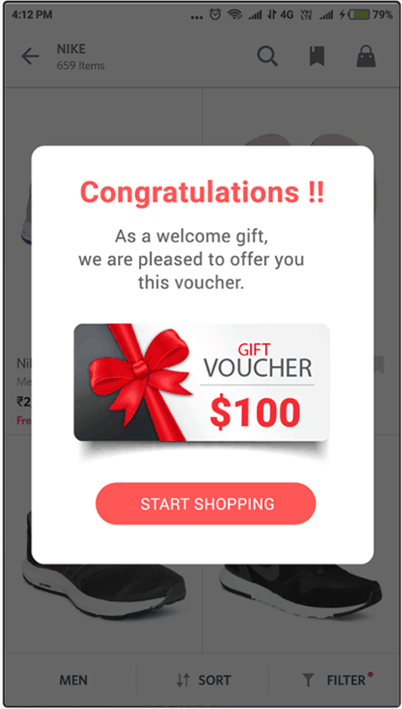 Brands like Nike, use in-app messages which trigger their buyer to make a purchase. The triggering message can be promo offers, first-time purchase discounts, or referral coupons. Content is not limited to just ebooks and blog posts. Webinars, push-notification, podcast, and videos are also forms of content. When used correctly, these various type of content helps you get the attention of your potential customers. The journey of your buyer will guide you to optimize and create highly effective personalized content. It will also help you target the right set of buyers at the right time. Which type of personalized content do you use to get the attention of the buyers? Please share your experience. Do you know of any other types of personalized content that you can use to connect with your audience? If so, please feel free to share your ideas in the comments.